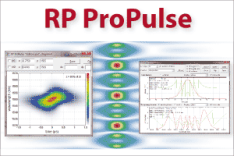 The software RP Fiber Power can be used for numerically simulating ultrashort pulse propagation. 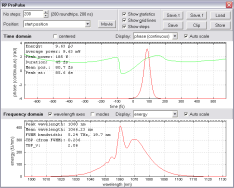 See a demo case for parabolic pulses in a fiber amplifier. Figure 1 shows an approximately parabolic pulse, as it can result from pulse propagation in a fiber amplifier under certain circumstances. Parabolic pulses have a number of remarkable properties, which have turned out to be particularly important in the context of fiber amplifiers for generating high-energy ultrashort pulses. Figure 1: Temporal profile of a nearly parabolic pulse, such as can be generated in a fiber amplifier fed with Gaussian pulses. Such simulations can be made with the software RP Fiber Power. Both grow with the cubic root of the pulse energy Ep, so that the time–bandwidth product of the pulses grows in proportion to Ep2/3. The default values in this form correspond to a pulse energy of 1 nJ in the diagram below. With increasing propagation length, the peak power rises in proportion to Ep2/3. The chirp rate (in THz/ps) approaches a constant value, which is determined only by the fiber dispersion and gain per unit length. The spectral bandwidth rises in proportion to the pulse duration, i.e., in proportion to Ep1/3. Figure 2: Evolution of the pulse duration in a hypothetical amplifier with infinite gain bandwidth. 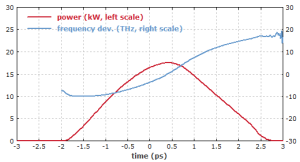 The solid curves show the pulse duration in the amplifier (blue) and after a compressor with optimized GDD (red). The dashed curve shows the asymptotic values, which in this case are reached after ≈ 20 dB of amplification. Depending on the input pulse parameters, in particular on the pulse duration and energy, the parabolic evolution may set in only after some amount of linear amplification. Therefore, the pulse duration and bandwidth do not necessarily rise by orders of magnitude even if the pulse energy is increased by several orders of magnitude. This is shown in Figure 2, where the seed pulses had 10 pJ energy and 500 fs duration. Initially, the amplification is nearly linear, but then both the bandwidth and pulse duration begin to rise significantly. Due to the increased bandwidth, dispersively compressed pulses can be significantly shorter than the initial pulses. Note that the limited gain bandwidth of a real fiber amplifier limits the pulse energy range in which parabolic pulse amplification is possible. The parameters in Figure 2 go far beyond that limit. Wave breaking is safely avoided. The pulses generated have no significant side lobes in the temporal or spectral shape. Such an amplifier does not require a seed source with carefully chosen pulse parameters, as these are not important provided that the amplification factor is large enough. The seed pulses may be significantly longer than the output pulses. They should not be too long, however, as otherwise the asymptotic solution is only slowly approached. As the amplified pulses have a nearly linear chirp, it is relatively easy to obtain nearly transform-limited pulses by dispersive pulse compression. However, higher-order chromatic dispersion of the compressor should not be excessive. The chirp during amplification can be an important advantage, because the amplification of transform-limited pulses could lead to excessive nonlinear phase shifts. The situation is therefore similar to that of chirped-pulse amplification, but with a lower amount of pulse stretching. The limited gain bandwidth effectively limits the possible pulse energy. For ytterbium-doped fibers with standard mode areas, it is of the order of some tens of nJ – far below the saturation energy. Therefore, with a parabolic pulse one can only extract a minor part of the stored energy in the fiber. This regime is thus most suitable for amplifying pulse trains with very high repetition rates but moderate pulse energies. In principle, the amplified pulse could generate a high Raman gain at some longer wavelengths, so that a strong Stokes pulse would be formed, and the original pulse would be distorted. However, a high enough Raman gain for that problem is usually not reached in a parabolic pulse amplifier. Higher-order chromatic dispersion of the fiber and a compressor should not be too strong. Amplifier noise may also be relevant under certain circumstances. To find an optimized design of a parabolic amplifier, it is advisable to study its behavior with numerical pulse propagation modeling, including the potentially disturbing effects mentioned above. The principle of parabolic pulse amplification has also been applied to mode-locked fiber lasers  (similariton fiber lasers). Here, the spectral width of the circulating pulse is strongly oscillating: it increases during amplification but is reset in every round trip by some optical filter. This approach makes it possible to reach significantly higher pulse energies with potentially cheap fiber laser sources.